Renavive Reviews: Does it Really Work? Before we uncover what exactly is in the Renavive kidney stones reviews, let’s analyze the claims placed on this product to know if indeed it’s safe and effective for use. We will be detailed and thorough with this Renavive review…, cool, right? So, what exactly is this product – Renavive? It’s an organic dietary supplement with ingredients that are designed to help the body eliminate kidney stones faster, and more effectively than other methods, according to its maker. The producer claims that users have seen tremendous success with this product in dealing with kidney stones especially the removal of calcium oxalate formed stones. Kidney stone supplements are meant to do three things. To inhibit the growth of oxalate crystals that eventually become kidney stones, help the body with dissolving already formed kidney stones – or both of this at the same time. Along that line, the manufacturer of Renavive natural kidney cleanse, claims their product has helped thousands upon thousands of users live a painless and kidney-stone-free life, like most other supplements out there. Who is the Manufacturer of Renavive kidney Stone Cleanse? This is the main product of Renavive an established kidney stone fighting company in the US. They claim to be a natural kidney support oriented company, and that they are ten years old now in producing and supplying this product. They add that thousands (literary over 10,000 Renavive kidney stones reviews – 90 percent being positive, are already on record since they began. How Does Renavive kidney Stone Cleanse Work? From the name you realize despite this being a supplement meant to help dissolve kidney stones, it offers kidney cleansing properties and more. According to details from the manufacturer, the first change users experience after taking this stuff is pain relief, from their aching kidney stone situation. The discomfort is said to disappear within a few days after you start taking Renavive. The ingredients in this supplement sip further into the system to help the body dissolve kidney stones. In essence, it the producer purports that Renavive does work effectively on stones of all sizes, type location of the kidney stone and quantity, to perform a thorough removal of the stones. Renavive kidney Stone Cleanse Ingredients – Are they Safe & Effective? This kidney cleanse supplement employs several ingredients all working together towards the goal of a kidney-stone-free-life, as well as healthy and functional kidneys. The producer claims these ingredients are hand-picked and have been lab-tested to work. Chanca Piedra (Phyllanthus Niruri, Lab-grade) – this ingredient has been used in various stone breaker supplements, top on that it’s said to improve kidney stone. Boerhavia Diffusa – claimed to strengthen the body’s cleansing or detox mechanism. Also eases pain and inflammation within the urinary tract. Marshmallow Root – helps the body to eliminate excess fluid, relief bladder infections, maintain kidney function and affirm kidney health. Celery Seed Extract– has diuretic properties in that it enhances smooth flow of urine which ideally helps to push out particles like gravel and stones in the kidney. May also lower inflammation and improve kidney health from its antiseptic qualities. Parsley Seed Extract – instrumental for stone expulsion as well as bringing in that soothing effect. Crataeva Nurvala – said to suppress the pain when the stone passes. Lawsonia Inermis – induces an anti-bacterial activity needed to protect the linings of the urinary tract. Sarsaparilla Root – purported to increase urine output, which logically raises the chances of scrapping stones out. What are the Advantages of Renavive Kidney Stone Cleanse? The supplement might significantly reduce your kidney stone pains. It might help to ease and quicken the passing of kidney stone. It is said to work on all types of kidney stones beginning with the calcium oxalate formed kidney stones. Does bring additional benefits, – keeping the kidneys continuously cleansed, detoxified and healthy, that you can keep using it even after passing stones. Said to be natural and safe on kidneys as well as other internal organs. What are the Disadvantages of Renavive Kidney Stone Cleanse? The product only gives a rough estimate of how long users need to wait to see changes, they say a few days – instead it needs to give something exactly, like after 2 or 3 days. The product doesn’t offer free shipping to users outside the U.S. They have not made available trial samples which aspiring users can request to be sure it works first, as claimed by most people. Most people who review Renavive are old people – saying it’s good, making it unclear how well it is working for young adults. 1 Q. 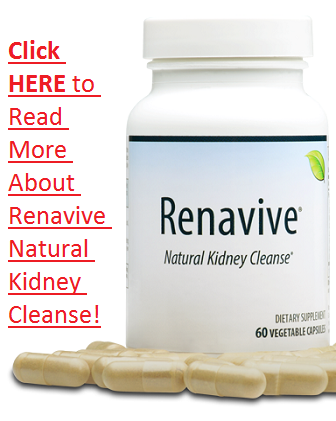 How to Take Renavive Kidney Stone Cleanse? Asn. The manufacturer has made this easy by instructing, users only need to take 2 capsules of this dietary supplement per day. However, the whole dosage goes for around 90 days or less. But that’s not the cut-line – happy users are free to continue using the product daily ongoing, as it helps to inhibit the future formation of kidney stones. 2 Q. How Much Does Renavive Kidney Stone Cleanse Cost? Ans. The list price for this product is $39 but currently, it has a bonus that lowers the price to $35 and claims to offer free shipping for US dwellers. Regular orders, however, may get a bonus or price cut mostly if they decide to subscribe to the replenish option. 3 Q. Where to buy Renavive Kidney Stone Cleanse? Ans. Retailer websites make the best option when ordering this product when it comes to free delivery as well as timely delivery. The reason I say this is because our work here is, we say what works more efficiently when it comes to ordering a product. 4 Q. What is Renavive Kidney Stone Cleanse’s Return Policy? Ans. The official company gives a 90-day money back guarantee for this product. However, it’s good that users return the product say 60-days after use if they don’t find it helpful. It’s also not clear whether they do extend their refund period upon request. 5 Q. Does Renavive Kidney Stone Cleanse Offer Free Trials for their Product? Ans. Renavive has not relayed their position about offers and trial pieces for this dietary supplement. Could be by inquiring about this, one may know their position on products for trial. 6 Q. Does Renavive Kidney Stone Cleanse Work? Ans. The manufacturer claims to have a database of over 10,000 users most of who are happy and satisfied with the product, however, there is a small group which doesn’t seem overly excited about it. 9 Q. How long to take Renavive Kidney Stone Cleanse? Ans. The stated time for taking this product is approximately 90 days, after which users who see changes such as stone reduction, stone clearing and elimination and ease of pain can continue taking it as long as they wish- since it’s an organic and natural dietary supplement. As in, users can use the product ongoing –past the 90 days to maintain the protection against future stones. Looking at the ingredients it’s clear that this supplement is more focused on stone removal. As in, roughly 75 percent of them are either increasing urinary flow, boost kidney function or dissolving particles. Besides these touted benefits, there is also an aspect that this stuff might help the body with fighting urinary infection, however, users may not be able to confirm this claim. Besides that, the manufacturer does not explain the exact chemical process which the stuff uses to inhibit kidney stone formation. The product, in other words, has a synergetic blend of organic ingredients including the popularly used component by most successful supplements – Chanca Piedra. This and all the other claims made by the manufacturer makes Renavive a viable fit for people who what to reduce their kidney health problems. “I used this product sometimes back under my ND’s recommendation. It worked quite well and I felt okay, but then I dropped it –talking of some 2 years ago. Now recently, I’ve been feeling some pain on my right side and I suspect it’s the same issue that’s trying to surface, so I went back to my ND he still has good standing with Kidney Korrect, I’m now painless and OK. Since it’s a dietary supplement and they it’s organic, this time around I intend to continuously use it to maintain my kidney health. I’m only 24 years and this stuff works really well with me, though it was only effective on the old, but I was wrong –it’s fine with a fine girl too! “This product helped me cancel my lithotripsy, well, that didn’t happen right away – I only felt okay after 6 months of using Renavive and it worked to keep me stone-free. Oxalate crystals are no longer able to cling as they used to before, which caused me two times stone removal. Happy to know I’ll not go through the process again because this dietary supplement inhibits my stone formation. “I’m not sure whether it’s this product that has helped me pass my stone test today – been using it for 4 weeks now, but I tend to think it worked for me!